This is the largest Island on Lake Victoria with most of the 350,000 population living on a minimal income of about 1.00/day, derived mainly from agriculture or fishing. This was Ruth’s first visit organised by Rotary, as previously she had travelled under the auspices of other charities or under her own steam. 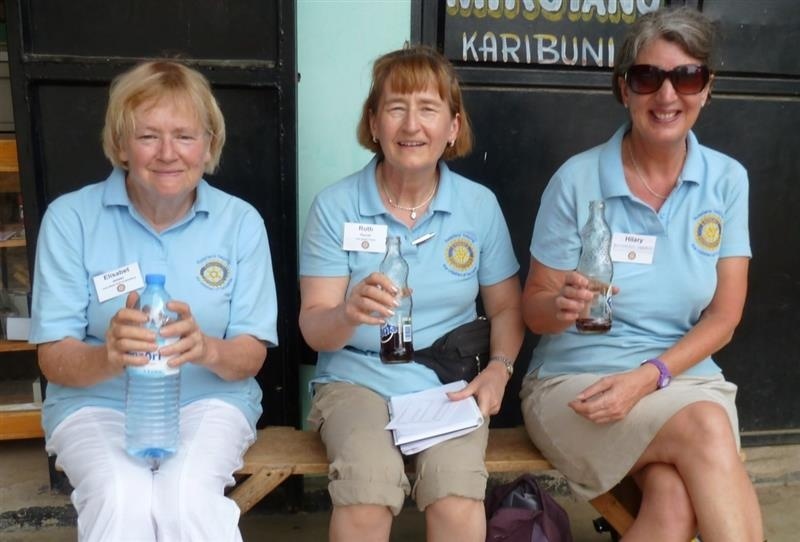 The team from Rotary Mirfield, had previously updated parts of the hospital at Nansio, added a maternity waiting hostel, provided running water and water filters. 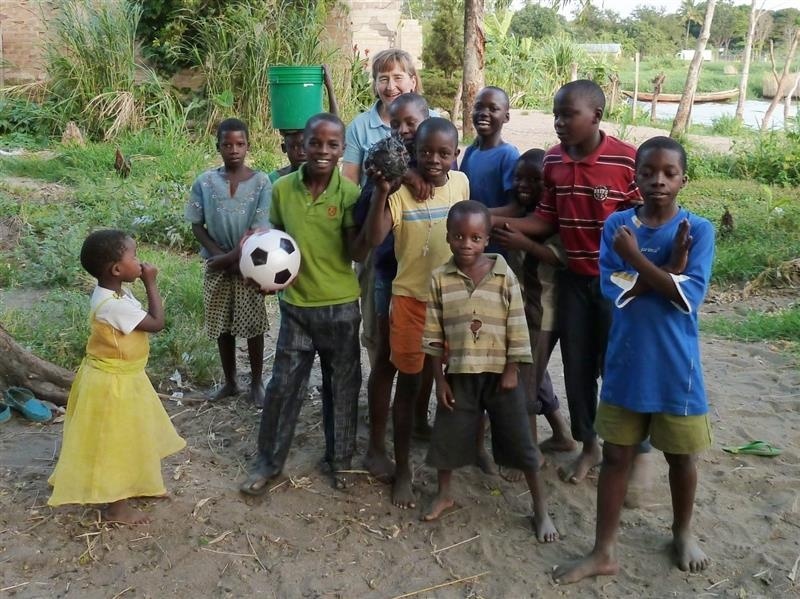 They had also piped water and built a playground for local schools. Micro-loans and beekeeping have also been started to encourage local business. On this visit, aided by two Swedish Rotarians and two technicians, the team replaced old foam hospital mattresses with locally produced wipe clean versions (sponsored by Rotary Braids) and also distributed locally manufactured water filters to 38 local schools, so improving the safety of the drinking water for 1000’s of people. The Rotary York Ainsty Specsort project supplied spectacles to those in need following a simple refraction procedure. Having departed Manchester on Wednesday afternoon to catch the overnight Amsterdam to Nairobi flight, Ruth had a one day layover in Nairobi before catching the Friday morning red eye to Mwanza via Kilimanjaro. Here she was met by two of the team and escorted to the ferry for the four hour crossing from Mwanza to Nansio. The weekend was spent assisting the team with Rotary, mattress changing and water filter duties and so Ruth was more than ready to start refraction clinics on the Monday morning! Setting up the clinics has become much easier with each visit. The two retired Rotarian nurses, both of whom have great compassion and communication skills, helped with each patient, despite the language barrier. Hilary became the ‘Mchunga Kondoo’ (Shepherd) and organised the patient flow. It had been years since she had worked with patients and she thoroughly enjoyed moving people around. As soon as one bottom left the chair, Hilary was there filling it with another. Such was her efficiency, Ruth was able to see twice as many people per hour than she had done previously. Elisabet was from Sweden. She was softly spoken with a gentle, loving and compassionate approach and organised the ‘Spectacles shop’ department, giving out the specs in return for big grateful smiles. She even offered people a choice of frames which Ruth had never had time, even to consider, in the past. The caring attitude of these two, contrasted distinctly with the approach of the local nurses who made less eye contact and were very firm with patient handling. This involved pushing the head back and forcing the lids apart to apply eye drops, without explanation or sympathy. watched the consultations. She soon learned the skills of refraction and by the end of the week, with encouragement she was handling all the patients and Ruth was able to leave her to it. 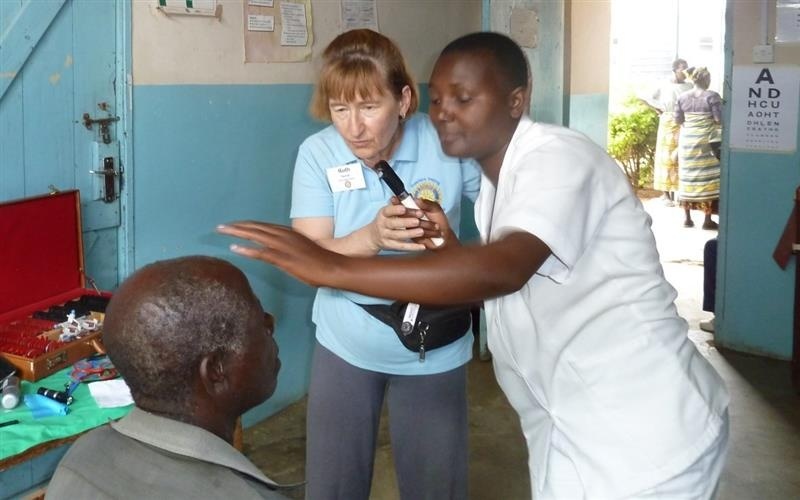 Ruth donated her pocket retinoscope and optical flippers to Celine and so was able to provide a long term benefit. Ruth states that ‘it is so deeply satisfying to teach myself out of a job’. We now need to send more spectacles for Celine to fit, so should you be travelling to Tanzania in the near future, can we give you some to take in your luggage?? Elisabet and her Swedish Inner Wheelers had also produced 750 ‘Days for Girls’ packs which were distributed to local school girls. To summarise the week, we held six optical clinics, three in Nansio, one clinic in Gallu (55 minutes by 4x4) and two clinics in Kagunguli (20 minutes by road). At the end of the final clinic, we had exhausted the stock of spectacles between +3.00 and -3.00D and were able to leave the higher powers with Celine for use in future locally run clinics. 759 people were seen and we handed out 569 pairs of specs. Walking home one afternoon we came across a bunch of children playing with a home-made football. One of them, Alfred, aged 12, spoke excellent English and after a short conversation he left all his mates behind and came with us to the market where we were able to buy him a real football. He and his mates were delighted to accept this gift. They were all so polite, restrained and respectful such that we bought them sweets as well. Alfred put four single boiled sweets in a bag for his friends until we encouraged him to have more. He was the opposite of greedy and offered the sweets around amid much jubilation when we returned to the village. Next year sees Ruth’s return to the Casamance in southern Senegal. Optometry must surely be the only profession to improve lives so dramatically, without the need for aftercare or maintenance. Thank you to everyone who has encouraged and supported the SpecSort project. Thanks to the Rotary York Ainsty team for their faithful support and technical expertise! 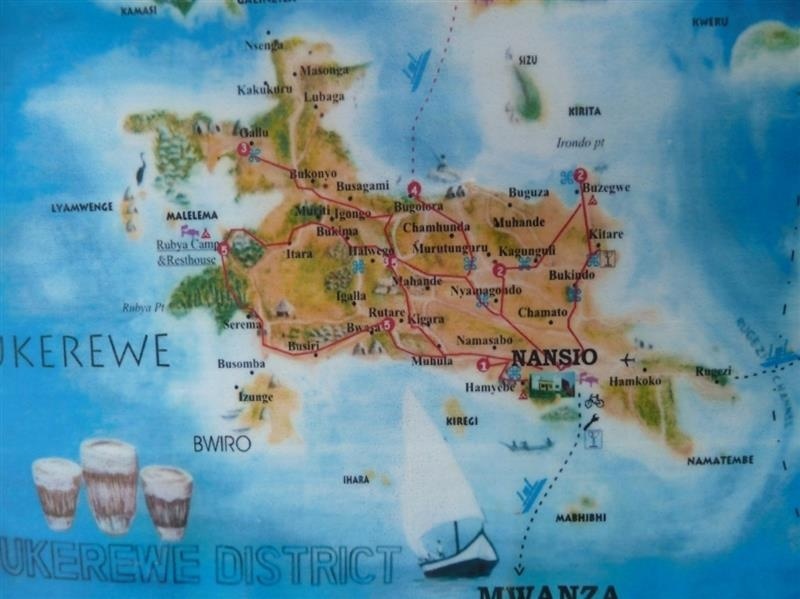 Finally, thanks to Dr John and Chris Philip of Rotary Mirfield, whose dedication and organisational skills, ensured that the Ukerewe (Mwanza) project again came together after a whole year of planning.